Here are a few graphs that I’ve created with Gephi, a very powerful tool for network graphs; the software is open source and you can download it for free. It might seem a bit intimidating to people who have absolutely no experience with network analysis software but there are tons of helpful tutorials out there, especially on YouTube. I will compile a list with my favourite ones in a follow-up post soon. It’s also good to have some knowledge about either Excel or SPSS (best both), as you will need data tables for calculating the network graphs (in CSV). I use Gephi for the visualisation of hyperlink patterns in online content but also for mapping relations between political actors, organisation, and, as in the present case, nation-states. For example, the graphs below show what countries were mentioned and with which other nation-states they were most frequently contextualised/linked to in EU crisis content from three European news media websites (Guardian, EKathimerini, and Spiegel Online, click to enlarge). I extracted the data from over 13.000 online articles published between March 2011 and March 2013. A node’s size indicates how often a specific country was named; the bigger it is, the more frequent it was mentioned or referred to in the sample. The lines (also called edges) show what countries were named together in the analysed content and their “thickness” indicates how often that occurred. 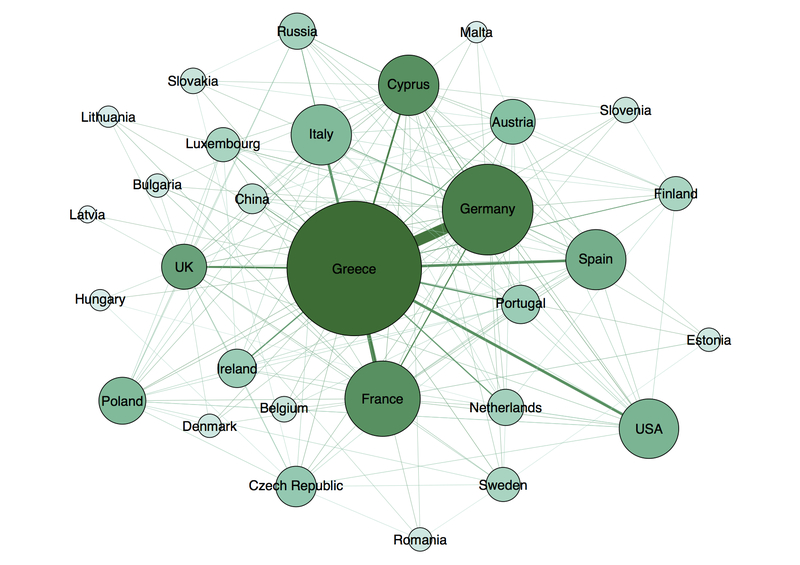 For example, Germany and Greece have a very thick connection across all platforms, which tells us that they were particularly often linked to each other in the EU crisis discourse; considering Germany’s dominant role in the EU bailout negotiations for Greece, this is little surprising. Still, the similarities across the four different European news media sites indicate significant tendencies towards discursive convergence in the EU crisis debate. The same can be said of Le Monde for which I have created the same kind of graph. Each platform seems to put particular emphasis on its own national context (UK, Greece, Germany, France etc.) 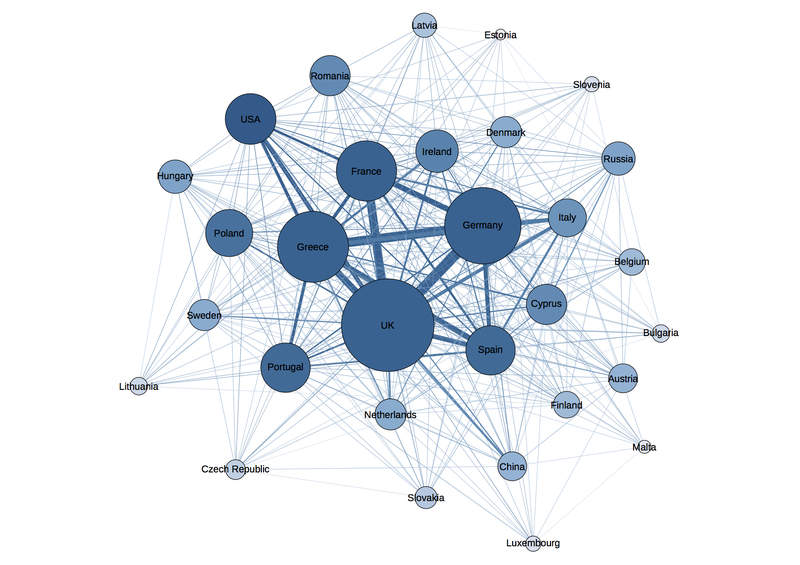 but in sum the networks between countries that are somehow involved in the EU crisis discourse look very similar. 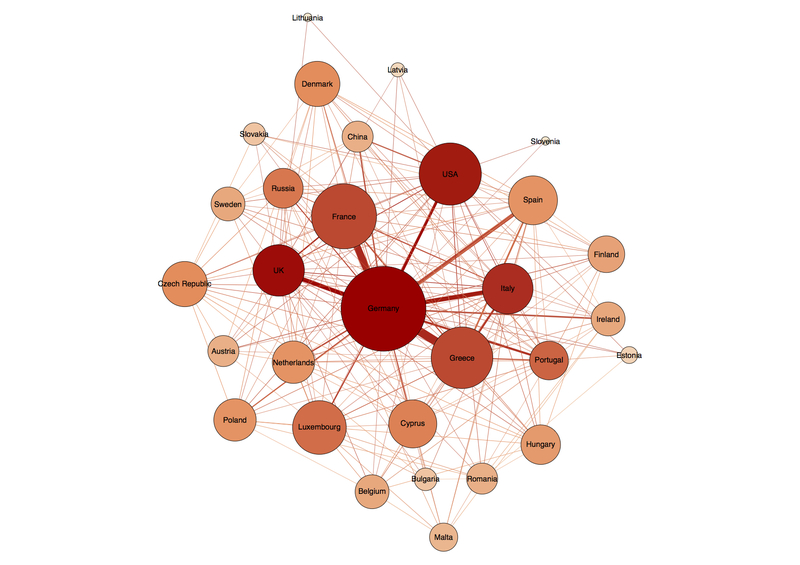 This type of graph thus allows to analyse the set of entities that are involved in a particular political discourse and enables a more detailed evaluation of how their relations to each other are portrayed in media content. Previous PostMultiple Fragmentation and Conflict: The EU Crisis’ Affect on Migrant Discourses in Europe Next Post2015 – The Year the Crisis Returns?